Time is up! The parent for this story failed the test with answer number 3. And probably should fail Parenting 101 in general! And while this did not happen in Pittsburgh, the absurdity of it made it worthy of a blog post here for sure. Maybe the kid will say he’s afraid of his bedroom in the dark and mom-of-the-year will teach him a lesson by putting the kid in his bed, telling him to stay there no matter what and then having someone pop-out from underneath the bed in an Exorcist mask after letting him fall asleep watching Freddy Kreuger movies. MOTY…. 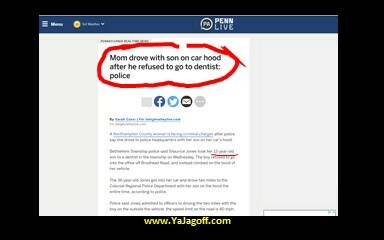 get it?… Mom-of-the-Year? I’m not here to call you stooooooooopid. Actually, I’m here to call you something else. Hope you enjoyed your drive and opportunity for one of those “teachable moments” as your kid was staring at you through your windshield! That’s such a great family tradition. Have fun at the magistrate MOTY… Ya Jagoff!